Crown Engraving: NoneDouble Line (+$24.99)Phrase - Explore Options (+$39.99)Initials - Enter Text (+$39.99)Twist (+$44.99)Jesus Fish (+$44.99)Flames (+$44.99)Crusaders Cross (+$44.99)Celtic Knot (+$44.99)Stars and Bars (+$44.99)Swirls (+$44.99)Interlock (+$44.99)Mayan Wave (+$44.99)Chevron (+$44.99)Braid (+$44.99)Tetra (+$44.99)Greek Key (+$49.99)Knurling (+$54.99)Aztec (+$54.99)High Roller (+$64.00)Aztec (with gold accent) (+$79.97)The One Ring (+$79.99) Font: Enter up to 50 characters. Font: Design: NoneCard SuitCirclesCloudClubsDiamondsDouble LinesFlamesFlowersFrillHash MarksHeartsHotrod FlamesJesus FishOriginal DiamondsOverlapping CirclesOverlapping DiamondsSpadesStars Enter up to 3 characters. Backbore Engraving: NoneStitch (+$29.99)Diadem (+$29.99)Initials - Enter Text (+$34.99)Phrase - Enter Text (+$34.99)Jesus Fish (+$29.99) Font: Design: NoneCard SuitCirclesCloudClubsDiamondsDouble LinesFlamesFlowersFrillHash MarksHeartsHotrod FlamesJesus FishOriginal DiamondsOverlapping CirclesOverlapping DiamondsSpadesStars Enter up to 3 characters. Font: Enter up to 25 characters. Cup Engraving: NoneDouble Line (+$24.99)Phrase (+$39.99)Initials (+$39.99)Celtic Knot (+$44.99)Crusaders Cross (+$44.99)Flames (+$44.99)Jesus Fish (+$44.99)Stars and Bars (+$44.99)Swirls (+$44.99)Interlock (+$44.99)Mayan Wave (+$44.99)Chevron (+$44.99)Braid (+$44.99)Tetra (+$44.99)Twist (+$44.99)Greek Key (+$49.99)Knurling (+$54.99)Aztec (+$54.99)High Roller (+$64.99)The One Ring (+$64.99) Font: Enter up to 25 characters. Font: Design: NoneCard SuitCirclesCloudClubsDiamondsDouble LinesFlamesFlowersFrillHash MarksHeartsHotrod FlamesJesus FishOriginal DiamondsOverlapping CirclesOverlapping DiamondsSpadesStars Enter up to 3 characters. This is a modification service only. You will need to send us your mouthpiece for custom work. Click Here to purchase a mouthpiece with modifications. 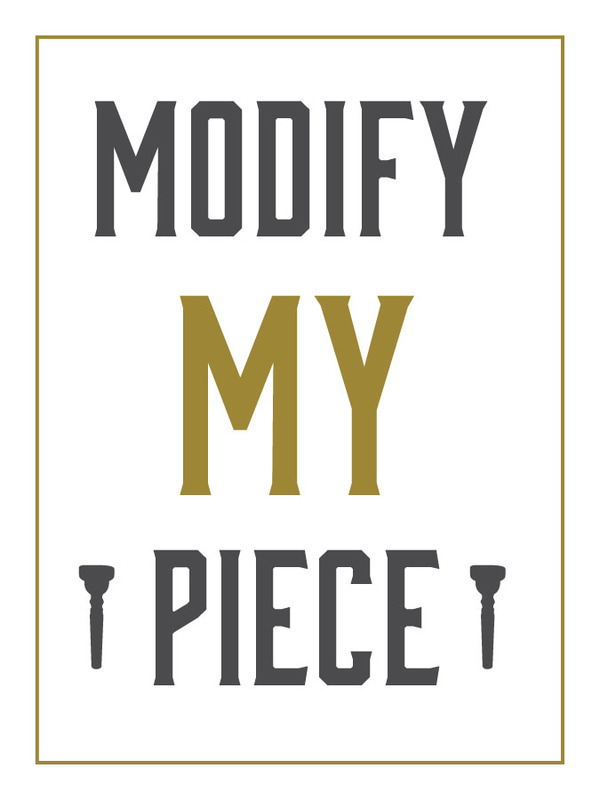 Select the modifications you'd like to have done to your mouthpiece and place your order. Clearly add your order number to your shipping label and cut the label out. Securely package your mouthpiece to send to us. See example photos below. Shipping Tip: We highly reccomend having your package insured. Use Priority Mail from the USPS to receive a free box that includes up to $50 of insurance. Send your mouthpiece to us for modifications! You'll receive an email from us once we have your mouthpiece and another once it's on its way back to you with a tracking number. Check on the status of your order any time by logging in to your account and selecting your order from the Account Information page. Important Information: DO NOT send us your one-of-a-kind, irreplaceable mouthpiece. Accidents happen - especially when using industrial machinery. If your mouthpieces is damaged during the modification process we will replace it with a mouthpiece of like model and wear. You are purchasing the modification service only- not the mouthpiece. The shipping charges are for shipping your mouthpiece back to you. It is your responsibility to get your mouthpiece to us. When will my mouthpiece be shipped back to me? The time estimate at the top when selecting the desired service(s) reflects the time it takes for that modification to be completed after it has arrived to us. Once we have received your mouthpiece we may deem it to be unfit for certain or all modifications. This may be because of wear-and-tear of the mouthpiece or becuase previous work on the mouthpiece hinder further modifications. If this is the case, we will return your mouthpiece and issue a refund minus the cost of shipping. Modification orders are considered Special Order thus your Credit Card/PayPal account will be charged immediately. By purchasing this modification service you agree to these terms and conditions.